Summary: This moving story is from the point of view of a young boy who lives in an airport with his father. He describes the community of other homeless individuals in the airport and explains how they try to avoid notice. When he observes a trapped bird discover freedom, the boy hopes for his own escape someday into a real home they can afford. 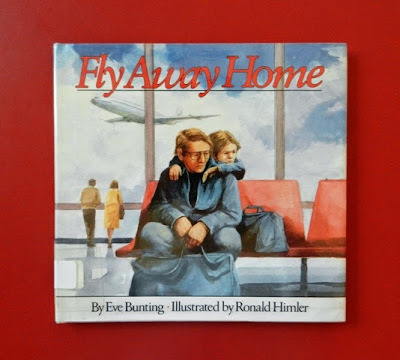 Hanna’s Comments: This is a heartbreaking story that sensitively explores homelessness in a way in which children will connect & be comfortable. Be sure to consider how your young audience might respond and be prepared to answer difficult questions. You might want to let parents know that you are reading this book and talking about this subject so that they might be prepared for questions too. We can't always and perhaps shouldn't protect our children from confronting poverty. You might have children in your faith family whose parents are among the working poor or who live on the brink of poverty. So many families are just a job loss or tragedy away from dire financial circumstances. Many have had to leave a home because they can't afford it anymore. As a nationally certified school psychologist and life-long Christian, I believe it is important to help children wrap their faith around such difficult issues and help them frame their feelings with sensitivity, hope, and facts. Then help them think of age-appropriate responses. Idea(s) for Application: Read this book in a lesson for children on social justice issues such as poverty & homelessness or in a lesson about the Babylonian exile & the Israelites' longing for home.